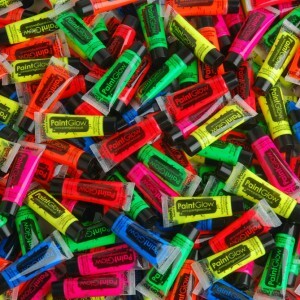 These small 10ml tubes of ultra special Glow Paint can be ‘charged’ with a light source to give off a spectacular Neon effect in the dark, and gives a fantastic glowing effect when exposed to UV light. The thick, concentrated paste makes it perfect for design and goes a long way! Easily removed with water, it can be applied to the face or body with a fine brush to create beautiful artistic designs or just add a splash of colour! However you can just use it “Comanche” style. We also stock more versatile body paint in 200ml bottles for splashing around or just covering on material or skin. Whatever you choose, you’re sure to madly glow!! Colours: White, Pink, Orange, Red, Blue, Purple, Green and Yellow!